This is book #2 in the rapidly-growing series from the people who brought you the Cupcake Diaries series. Tamiko, Sierra, and Allie are best friends. 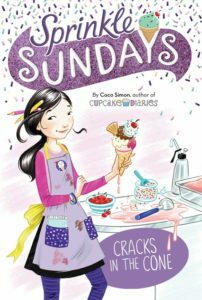 When Allie’s parents split up and she moves to a nearby town, the three girls spend their Sundays working at Allie’s mother’s new ice cream shop. The girls struggle to maintain their friendships while living in different towns and working together. Tamiko has some great marketing ideas which she offers to Allie’s mom (Mrs. S) who is a bit behind the times (can you believe she doesn’t even have a SuperSnap account?!). But Tamiko has to balance helping to grow the business with her core job responsibilities (like showing up on time!). This book is filed with great examples of marketing and customer service. Much of the marketing mentions revolve around social media and how to use it to spread the word about the ice cream shop. The shop doesn’t have a social media account so the girls post photos and use hashtags to spread the word from their own accounts. When Mrs. S mentions that business is slow on Tuesday, Tamiko goes old school and creates a “Buy One, Get One Half-Off” coupon for the shop that increases the Tuesday business. Tamiko also has a great feel for customer service and is a natural salesperson. She knows exactly what each customer wants (even when they don’t know it themselves) and can deal with different personalities. When a nurse comes in and doesn’t look happy, Tamiko notices the unicorn barrette in her hair and offers her a unicorn sundae to brighten her day. The woman becomes a repeat customer and even brings two friends to the shop. Tamiko also has to manage some tough customers including the appropriately named Grumpy Guy! Mrs. S, the shopowner, does a good job of managing her young employees and making them feel invested in the success of the shop. When the girls are late for work, she’s firm and explains how their tardiness impacts the shop and other employees. When Tamiko gets a little too aggressive with her marketing efforts, Mrs. S reels her in but also encourages her to continue to think of new ideas. Other business concepts represented in the book include employee relations, sales, and business planning. Much of the marketing discussion in this book involves social media. While we’re not suggesting your kids go out and get social media accounts, nor are we suggesting you always stop thumbing past those annoying sponsored posts in your feed, take the time with your girls to show them how businesses market themselves on social media. It’s also a good opportunity to explain the difference between a friend or liked-business post and a sponsored post so she can learn how to identify advertising. Do you have a favorite restaurant or store? One that makes you feel special when you walk in? Talk to her about what that business does to create that special feeling. Show her the difference in that store’s hospitality versus that of a business for which you don’t feel the same attachment. 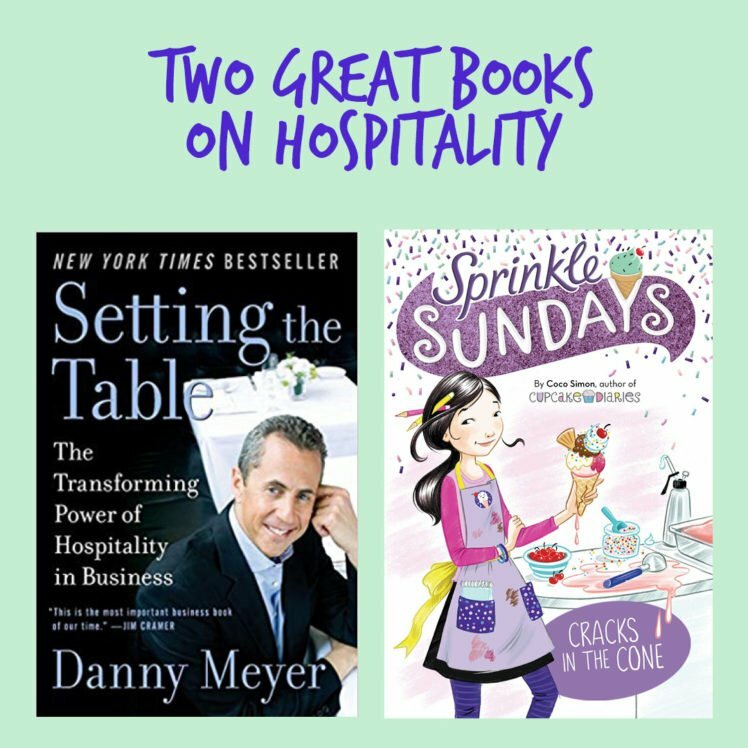 Reading about Tamiko’s customer service and hospitality made us think about the restaurateur Danny Meyer, of Union Square Cafe, Gramercy Tavern, and Shake Shack fame. When we walk into a new restaurant in New York City, we can always tell if it’s run by Danny Meyer. His focus on hospitality sets him and his restaurants apart in the dining industry. His employees are agents of their customers not gatekeepers to his restaurants. They make you feel as if they are on your side, wanting you to have the best experience possible. 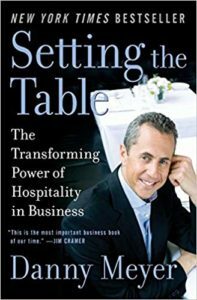 In Setting the Table: The Transforming Power of Hospitality in Business, Danny Meyer shares his secrets and explains his theory of “Enlightened Philosophy” in which he believes that businesses should put employees (not customers) first. By putting employees first, they feel “jazzed about coming to work” enabling them to treat customers in an enlightened way which will earn raves, repeat business, and develop bonds of loyalty. When Tamiko notices the unicorn barrette in the customer’s hair and suggests the unicorn sundae, that is what Danny refers to as “connecting the dots” – learning information about your customers to be able to make a meaningful connection with them and create a sense of “shared ownership.” Connecting the dots leads to repeat customers and positive word-of-mouth (as it did in this case as the nurse came back and brought two friends!). Danny’s Union Square Hospitality Group offers hospitality training to Fortune 500 companies. Setting the Table shares many of the same principles for just $16.99.